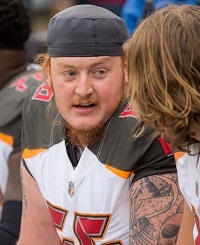 The film on Ryan Jensen led a Buccaneers-paid expert and an alleged team of experts to blast the game of the Bucs’ big-money center. Jensen playing to the whistle is obvious and he makes others on the Bucs’ O-line look bad in that department. But how is Jensen actually performing? Former Bucs blocking tight end John Gilmore says the Tampa Bay front office must be perplexed. Gilmore, a member of the Buccaneers Radio Network, said his film review looks bad for the man in the middle of the offensive line and his mates. “Offensive line just isn’t playing well. Assignment mistakes, they’re getting beat physically,” Gilmore said. “You know, we brought a guy in like Ryan Jensen; and I know he’s a big effort guy, kind of a scrappy player. But to be perfectly honest, I’m just not impressed with his play. If that wasn’t bad enough, the data freaks at Pro Football Focus, aka the PFF Tribe, issued midseason rankings for NFL offensive lines. They ranked the Bucs O-line 17th overall and directed threw a lot of shade at Jensen. We’re only eight games in, but Ryan Jensen already looks like one of the worst free agent signings of the offseason. At the time he signed his four-year, $42 million deal, it was a head-scratcher and makes even less sense now. The former Ravens center was coming off a paltry career-high 71.4 overall grade and has been even worse in Tampa Bay. His 53.8 grade is one of the lowest at the position, and his 15 pressures allowed is already more than last season. There’s a lot of criticism out there of the Bucs’ offensive line. But Joe is trying to keep a little perspective. Sure, Joe sees the bad moments, but the Bucs rank second in the NFL in yards per game. The offensive line can’t be that bad. They should be better, though, especially in the red zone and in the run game. They’re not exactly imposing their will consistently on defensive lines in those areas. What does the OL coach have to say? The Bucs DO have one, correct? I’m surprised the line is ranked 17th. When you are the one of the worst teams you gotta overpay for FA’s to come to your team. We did the same thing back in 2012 but only V-Jax was worth it (Carl Nick’s had the unfortunate MRSA toe). The Bucs and Colts were the top teams interested on Jensen. We knew what we were getting with him. A guy with average to sloppy technique but he gives 110% effort ALL THE TIME! How many other current Buccaneer O-Linemen can say the same thing? (Looking at you D.SMITH 76) he also is nasty and is a DOGG who sticks up for his QB and is always ready to throw down. Watch the Saints, Steelers, and Falcons game this year. This man is who you want next to you when Sh!t pops off! He is getting negative help from the right side of the O-Line but what can you expect from this coaching staff and GM? The OLine coach was fired at Arizona, Dallas and SF. Seems like we’re seeing the same results here. So Jason Licht can’t really draft well consistently, and his free agent choices are almost always failures. Cool. The guy has only played center for a year, and had a nice year, but not exceptional, and before that was just a role player, and the Bucs made him the highest paid center in the league. I didn’t get the signing at the time as it took a lot of projecting to assume that he only not would continue to improve, but that he wouldn’t take a step back, since again, he was just a role player that got a job because of injury and he wasn’t good enough for the Ravens to want to keep (even with the salary cap, if you really think you have the guy worth being the highest paid center in the game, you figure out how to get that done). Also the Ravens fans didn’t really complain that much, it was like, sorry to see him go, but he’s not worth that kind of money, not even close. Anywho I’m not sure he’s played poorly, but he hasn’t done anything to impress either. But then again unlike that 6-time pro bowler GMC who is always smiling, Jensen doesn’t smile, he’s mean and makes sure to get 15-yard unsportsmanlike penalties to prove how mean he is. Grrrrr…. so mean…. he’s mean…. grrrrrr…. and since he’s mean and doesn’t smile the dopes on the message boards think he’s the best player in the game because it proves he’s a “leader”… because leaders need to be mean… gggrrrrrr…..
Anywho he seems like an OK guy who is vastly overpaid – which seems to be what others say. On the positive side I don’t know about the fake new PFF ratings, but the Bucs have had just about the worst offensive line in football for 2 straight years, so if they’re up to 17 that’s quite the improvement. 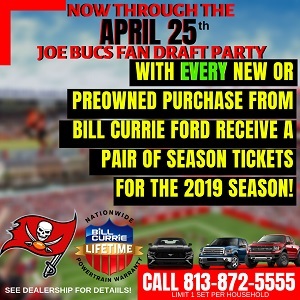 Licht has to take some of the blame when it comes to the performance of the o-line, he’s the one who drafted/signed the players,however,the one constant the Bucs have with the oline is coach Warhop. He has been with the Bucs for five years now if i’m not mistaken and his oline’s have been mediorce to say the least. Every season he talks about how Donovan Smith is going to take that next step to be top 5 lineman in the league and Smith never does, in fact the entire oline as a group hasn’t improved. They can’t get any push in the run game and pass blocking is inconsistent. Warhop has been dodging blame for a while. The Bucs are -15 in turnovers vs opponents. That is the main reason they are 3-5. DL doesn’t pressure opponents’ qb’s. He was playing at an elite level for the first 2 games and has since dropped off considerably. I think you’re blinded because you are comparing Jensen to other Buc players. He’s better than the rest of the ragtag bunch on this team. Look – our LT is subpar at best. We have Marpet. That’s it. That’s the job Licht and the offensive coaching staff has done with that line. I’ve noticed several plays where Jensen was overpowered and bull rushed back into the pocket. Licht’s free agent flops only outdone by the top 3 picks he made in this year’s draft. Not sure any other NFL team will hire him above a regional scout slot moving forward. Maybe a podcast Dom & Dumber would have legs if/when he and Dominik join forces. Well we are in Florida so …..RECOUNT! Dude is playing next to a turn stall in bennioch..
PFF Mike is not an objective analyst. PFF assigns pressures as a full event for two players if both are involved instead of splitting the event. He was pissed when the contract was signed and continues his mission of slander against my radiant locks. He is a weasel of epic proportions. I’m so confused, are you saying Jason Licht might have signed a free agent bust? 😯 I have NEVER heard of that happening before Joe. Jason Licht has such a sterling record with free agents like Ghost Johnson, Floppy Hat Sweezy, Nick Folk and Anthony Collins this can’t be right. There must be a mistake!! When you have a losing record? The Hits just keep on ah comin! Every offensive lineman Dirk has inherited has regressed. He has not been able to untapped the potential of a few others and has played some guys in the wrong position. Our run blocking has gotten more atrocious every passing year under Dirk. I’m not judging any offensive lineman under Dirk. I think better coaching could get more out of all of them. Rod Munch…so what you’re saying is grrrr McCoy is a wuss? Dirk inherited 2 very capable rookies who showed a lot of promise. Their play went downhill in year 2 and that is not normal. It must be all that money in his pockets weighing him down! When Coach L. Smith was fired, I wanted Coach Warhop to go as well. I do not see results on the field for all of the Praise, and accolades this guy gets. Yes he is a NFL Oline coach, and has been for years, the past few here. How good and dominant have we looked with Coach Warhop leading that unit on Gamedays? Yes Logan Mankins last season we had some good Oline play. With Coach Warhop in charge. IMO Logan Mankins gets extra credit for his professional efforts. This effort he brought everyday spread throughout the line. We miss this on our Oline today. As it stands today are we getting better Oline play? I do not see it. We are better than okay at Pass blocking, but we can not mow down a solid path across the sand at the beach. Unless it is our arses being pushed backward right into the RB’s running lane. No Run blockey = no chance for a Playoffey. Worst game in along time , how do you go 480 yds and get 3 pts ? Coach needs to go! Are you sure it’s not the rg who’s got the issues?